There’s nothing like a fun discovery-walk with a capable camera and an inspired guide to help you capture the experience in a new way! 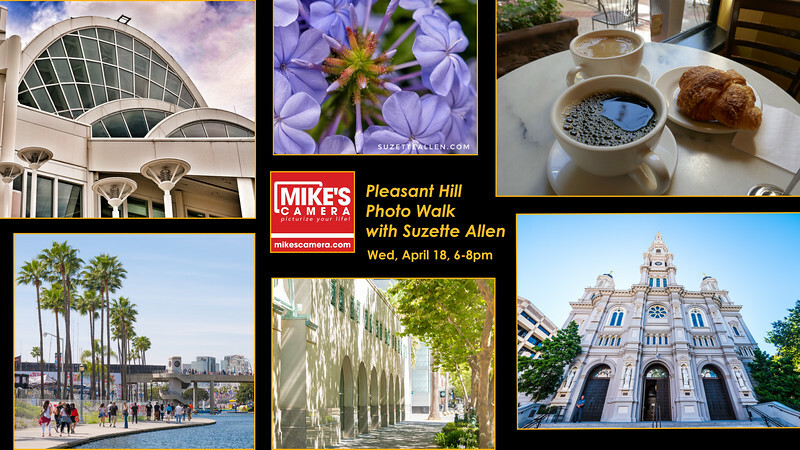 Join Suzette Allen and Jon Yoshinaga, both Lumix Ambassadors, who will take you on a fun photo walk near Mike’s Camera in Pleasant Hill to see how you can capture your city in style! Bring your Lumix camera (or borrow one to test out before the Weekend Sale). We will be exploring the beautiful area and capturing the sights while learning how to use creative filters, exposure and focus modes, lens options and macro, even a bit of video and time lapse! You might also bring a tripod for time lapse, and night shots. Since sunset is at 7:46pm, we will be shooting night photos with city lights as well! (or you can put Lumix’s iOS to the test!)! We will start off in the store with a primer and camera setup, then head out to explore and shoot until dark! Please join us for the fun!